Use the Builder Settings page in the Makefile Projects preference panel to define build settings. Builder type Select the type of builder used by the project. Use default build command Select this checkbox to use the default make command. Clear the check box to specify a new make command. Build command If you clear the Use default build command checkbox type a new make command in this field. 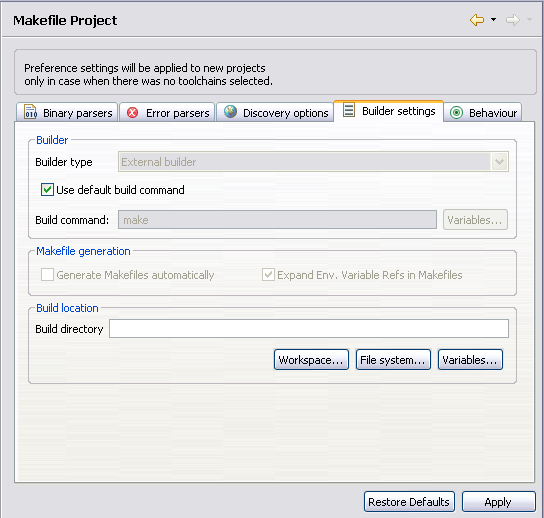 Generate Makefiles automatically Activate to generate makefiles automatically during a build operation. Expand Env. Variable Refs in Makefiles Activate to expand environment variable references in the generated makefile. Build directory Type the build directory path, or click Workspace, File system, or Variables to specify the build directory.